It's time for another edition of "Seavers in the News" - a semi-regular feature from the historical newspapers about persons with the surname Seaver that are interesting, useful, fun, macabre, or add information to my family tree database. "Henry E. Seaver, formerly of this city, died yesterday at Hartford hospital from injuries received Sunday when his automobile was truck by a trolly at Rocky Hill, Ct. Mr. Seaver was driving out of his yard when a north-bound Middletown car, which passes the house, struck the automobile, causing it to plunge into a ditch. Mr. Seaver was found unconscious under the wreckage and hurried to the hospital. "He was born in this city and received his education here, and was later employed at Meekins, Packard & Wheat's and the Armory. He was a member of the 2d Regiment band. He left this city about 20 years ago, and was treasurer of the Eastern Music Publishing company of Hartford. He was a member of the band of the 1st company, Governor's Foot Guard there. "His widow was recently called to California by the death of her mother and is at present on her way home. Besides his widow, Mrs. Clara Seaver, he leaves two daughters, Miss Edith Seaver, and Miss Dorothy Seaver, all of Rocky Hill, Ct. He also leaves his parents, Mr. and Mrs. W.T. Seaver of this city; four brothers, F.L. Seaver and W.C. Seaver of this city, H.F. Seaver and W.H. Seaver of Agawam, and two sisters, Mrs. Harvey Merrill of Arlington and Mrs. C.W. Bostick of Hartford. Funeral arrangements will be announced later." "Former Local Man Dies From Injuries," obituary, Springfield [Mass.] 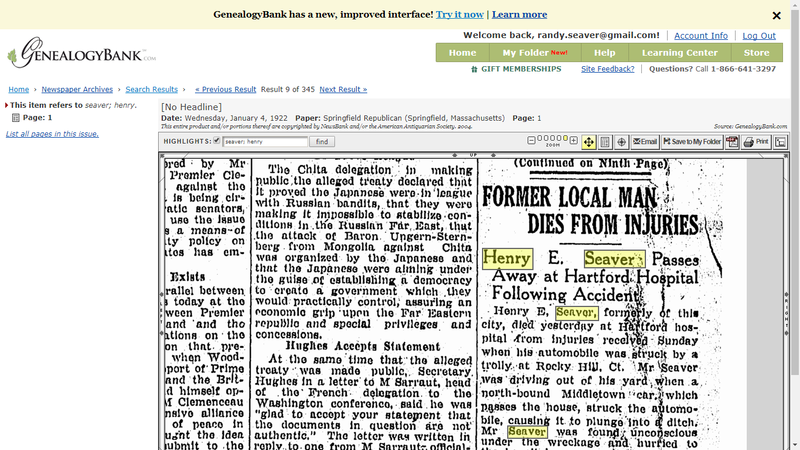 Republican, 4 January 1922, page 1, column 6, obituary for Henry E. Seaver; GenealogyBank (http://www.GenealogyBank.com : accessed 6 September 2017), Newspaper Archives collection. I had this Henry Edward Seaver in my RootsMagic database, and have records for all of his family. However, I did not have his death date - only 1922 from the Find A Grave memorial. Now I know that he died on 3 January 1922 in Hartford, Connecticut. The obituary also provided information about his occupations and positions. At the time of his death, daughter Edith Seaver was age 25 (the eldest child) and daughter Dorothy was age 14 (the youngest child). Henry and Clara had four other children between 1898 and 1905, who all died shortly after birth. Clara (Chaney) Seaver (1872-1942) was Henry's widow. Henry's parents were William Titus and Ellen Jane (Davidson) Seaver, the four brothers mentioned are Frederick Luman Seaver, Winfred Clark Seaver, Benjamin Franklin Seaver, William Herbert Seaver, and the two sisters mentioned are Edna Maria (Seaver) Merrill and Grace Foster (Seaver) Bostwick. Henry Edward Seaver (1871-1922) is probably a distant 4th or 5th cousin several times removed, but I don't know who his 3rd great-grandfather was. I suspect it was my 6th great-grandfather Robert Seaver (1702-1752), perhaps through son John Seaver.